Intex Aqua Zenith has a 5-inch FWVGA display with screen resolution of 480x854 pixels powered by 1.1GHz quad-core MediaTek MTK6737M processor with 1GB of RAM and 8GB of internal storage which can be further expanded up to 128GB via microSD card.On Camera, it has a 5-megapixel rear camera and 2-megapixel front-facing camera.The smartphone runs on Android 7.0 Nougat packed with a 2000mAh battery on the connectivity front, the dual-SIM device supports 4G, VoLTE, Wi-Fi, Bluetooth, GPS, FM Radio and Micro USB port. available in Classy Gold and Black color variants priced at Rs 4,599. Intex Aqua A4 features a 4-inch WVGA (480 x 800 pixels) display and is powered by a 1.3GHz quad-core processor with 1GB of RAM and 8GB of internal storage which is further expandable up to 64GB. On Camera, it has a 5MP Rear camera and 2MP front camera. Connectivity options include 4G VoLTE, Bluetooth, WiFi 802.11 b/g/n, GPS Packed with a 1750mAh Battery. The phone comes pre-installed with apps like QR Code reader, Gaana, Xender, and others. Intex Aqua S3 has a 5-inch HD Display powered by a quad-core Spreadtrum processor with 2GB RAM and 16GB internal storage. On camera, it has an 8-megapixel rear camera with LED flash and a 5-megapixel front-facing camera that also has LED flash for taking better selfies in low lighting conditions.Connectivity options include 4G VoLTE, WiFi 802.11 b/g/n, Bluetooth 4.0, GPS Packed with a 2450mAh battery. Intex Aqua Power IV has a 5-inch FWVGA screen powered by a 1.3GHz quad-core MediaTek 6737 processor with 1GB RAM and 16GB of internal storage.Dual SIM device runs on Android 7.0 Nougat. It has a 5-megapixel camera on the front and back with LED flash for both.Connectivity options include 4G VoLTE, WiFi 802.11 b/g/n, Bluetooth 4.1, GPS Packed with a 4000mAh battery. Xiaomi Redmi 5A has a 5-inch HD display powered by a quad-core Snapdragon 425 processor with 2 GB RAM and 16 of internal storage.Dual SIM device runs on MIUI 9 based on Android 7.1 (Nougat). It has a 13-megapixel rear camera with PDAF, LED flash and a 5-megapixel front-facing camera.Connectivity Options include 4G VoLTE, Wi-Fi 802.11 b/g/n, Bluetooth 4.1, GPS + GLONASS.Packed with a 3000mAh built-in battery. Karbonn A40 Indian has a 4-inch (800 × 480 pixels) WVGA touchscreen display powered by 1.3 GHz quad-core processor with 1GB RAM and 8GB internal memory, expandable memory up to 32GB with micro SD. 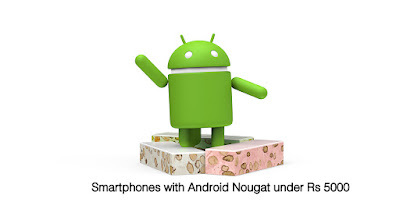 Dual SIM device runs on Android 7.0 (Nougat) OS. It has a 2MP rear camera with LED flash and 0.3MP (VGA) front-facing camera Packed with a 1400mAh battery. Sansui Horizon 2 has a 5-inch HD display, is powered by a quad-core MediaTek processor, runs on Android 7.0 (Nougat), It has an 8-megapixel rear camera with dual-tone LED flash and a 5-megapixel front-facing camera that also has LED flash.Connectivity Options include 4G VoLTE, WiFi 802.11 b/g/n, Bluetooth 4.0, GPS Packed with a 2450mAh battery. Xolo Era 3 feature a 5-inch HD display is powered by a quad-core MediaTek MT6737 processor with 1GB RAM and 8GB of internal storage which is further expandable with MicroSD card up to 32GB. Dual SIM device runs on Android 7.0 Nougat.On camera, it has a 5-megapixel rear camera with LED flash and a 5-megapixel front-facing camera. Connectivity options include 4G VoLTE, WiFi 802.11 b/g/n, Bluetooth, GPS packed with a 2500mAh battery. Xolo Era 3 comes in Slate Black color Priced at Rs 4,999 in India. 10.or D features a 5.2-inch HD display powered by 1.4GHz quad-core Qualcomm Snapdragon 425 processor, coupled with Adreno 308 GPU.It has 2GB RAM, 16GB Storage and 3GB RAM, 32GB Storage. On Camera, it has a 13-megapixel rear camera with LED flash.and 5-megapixel front-facing camera. 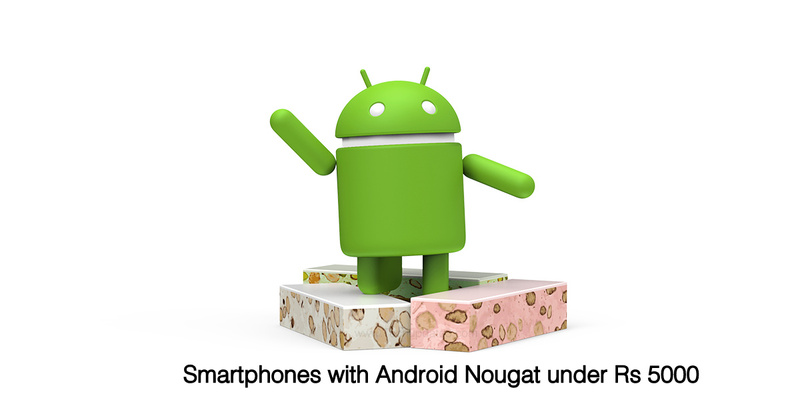 Dual SIM device runs on Android 7.1 Nougat out of the box. Packed with a 3,500mAh battery.